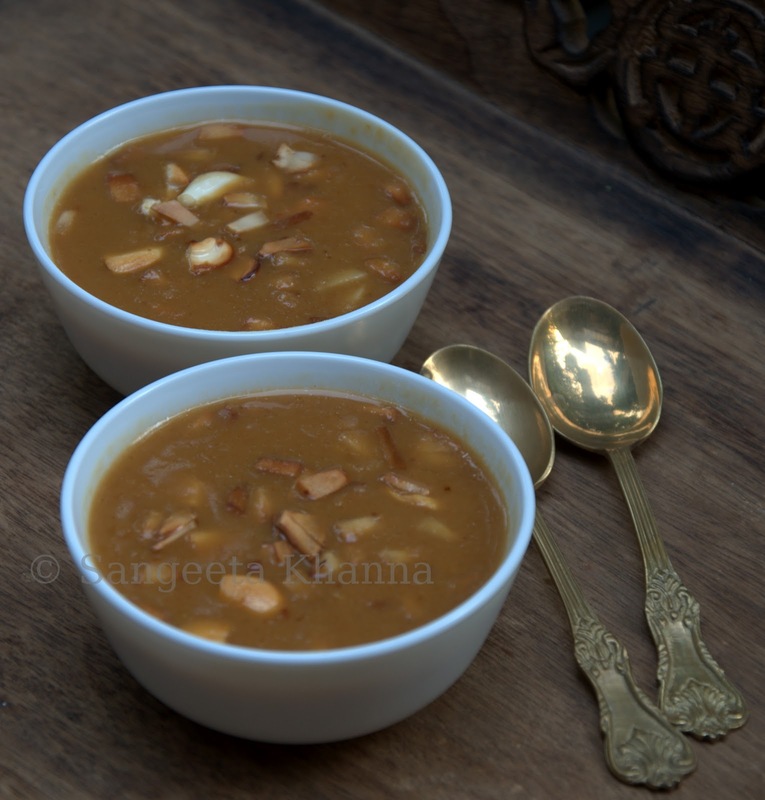 banaras ka khana: parippu pradhaman | mung daal kheer in coconut milk base..
parippu pradhaman | mung daal kheer in coconut milk base..
Long time back when I read an elaborate recipe of parippu pradhaman I wanted to taste this mung daal kheer immediately. It had everything that I love.. coconut, jaggery and a lentil base. But as it happens our attention span is so minuscule that it slipped off my mind completely. Though kept knocking at the back of my head whenever I used jaggery for other things. This Onam when I was chatting with Rajani, she talked of this again. And then it was just irresistible for me to wait. Read the recipe again and with some more inputs from her, I started with it right away. Half an hour later a superbly aromatic dessert was ready and I licked the spoon. It was a revelation.It is not a kheer. Noway related to a kheer of north India but equally great in taste and flavors.I am hooked to it. Made it once more after that as we both just loved it. My mung daal consumption has increased now. 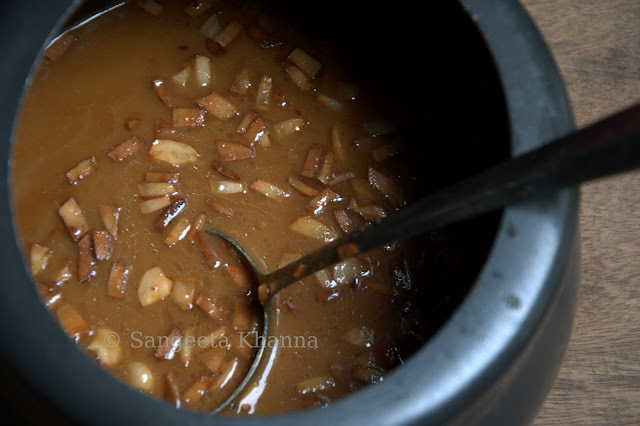 Take a wide base pan and dry roast the mung with a tsp of ghee on medium flame till it turns pink and aromatic. Put it in a pressure cooker with the water and pressure cook till the first whistle blows and then about 4-5 minutes more on low flame. let it cool naturally till the pressure releases. Add the jaggery and the coconut milk and cook for about 3-4 minutes, the Pradhaman get thick like a slurry. Taste the pradhaman for sweetness, you might like to add a little more jaggery to it, depends on the brand of jaggery being used as all of them have different intensity, being an unrefined sugar with a lot of minerals in it. Heat the remaining ghee in a small pan and fry the cashew first and then add the coconut bits to fry till pink. Add this hot ghee mixture to the pressure cooker. Mix well and serve warm. I just loved it warm. The comfort of a lentil is always nice for me, never knew it would be in this form as well. I am not a dessert person but some desserts like this make me really go week in my knee. Jaggery and coconut, bound to be happy together. I chilled the leftovers to see if we like that more. Arvind was okay with the chilled version but for me it will always be warm. Quickly reheated in microwave, my bowl of dessert comfort. 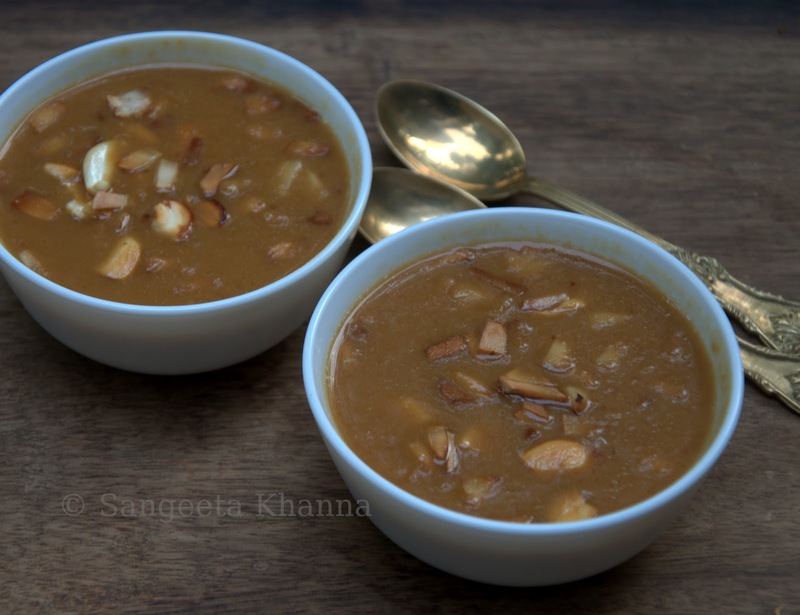 This Parippu Pradhaman is definitely healthier than a rice kheer. Lesser Glycemic load for sure. Provided you don't make it too sweet. I would recommend milder sweetening of desserts, as it allows the other flavors to shine through. And a pleasant aroma of roasted mung is the USP of this Pradhaman. Jaggery comes next and he Coconut flavors stays in the background. The fried Cashew and Coconut bits add a nice additional flavor and bite. Just lovely. Try this if you haven't tried this Kerala delicacy yet. 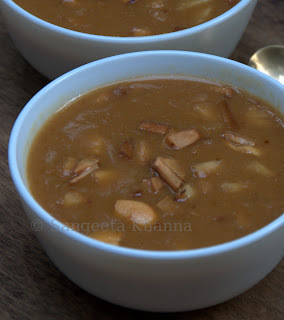 Oh wow.. u finally made it..:) It is one of the desserts in the Kerala cuisine. And if u can make it with the freshly extracted cocnut milk..ah.. slurpppppp!!!! Karonde ka achar : Instant seasonal pickles..